Escuela de Español Activo is integrated into EUSA University Campus, a modern educational setting that has been providing services to students for over 50 years. Given the international scope of the Campus, EUSA welcomes students from all over the world every year, fostering intercultural exchange while learning in a global environment, and it is also an accredited centre by the prestigious Cervantes Institute. 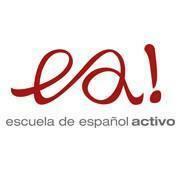 Escuela de Español Activo provides the opportunity to learn Spanish through communicative and experiential methods, combining skills practice with grammar reflection. Our range of Spanish courses is designed for students and professionals who wish to reach a competent level in the second most widely spoken language in the world. We develop programs accredited by the Chamber of Commerce of Seville, and following a common educational policy of enhancing employment opportunities, we specialise in Spanish Courses with specific purposes oriented to different professional areas, as well as in language immersion learning methods. Our mission is to accompany each student on their Spanish language immersion experience, making their stay in our school an unforgettable personal time and a turning point on their path to professional success. Our vision, is to encourage learning by means of an “Active Method”, where each one of our students, helped by our team and resources, takes the leading role of their own learning. Our main values are high quality teaching and commitment to employment.